Postcard, posted in March of 1911, showing East Robinson Avenue a few blocks north of Central Boulevard in Orlando, Florida. The avenue was named for Samuel Robinson of Emmett, Michigan, who was a surveyor for Orange County for seventeen years. He was responsible for planting the many trees along Magnolia Avenue where he built his home. Now called Robinson Street, the road passes along the northern shore of Lake Eola. Original 5.5 x 3.5 inch color postcard: Private Collection of Thomas Cook. Digital reproduction of original 5.5 x 3.5 inch color postcard. Private Collection of Thomas Cook. Copyright to this resource is owned by Thomas Cook and provided here by RICHES of Central Florida for educational purposes only. Dickinson, Joy Wallace. A Guide to Historic Orlando. Charleston, SC: Arcadia Pub, 2003. 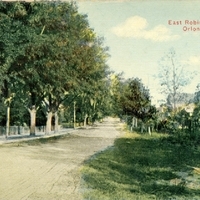 East Robinson Ave., Orlando, Fla.
“East Robinson Ave. Postcard.” RICHES of Central Florida accessed April 24, 2019, https://richesmi.cah.ucf.edu/omeka/items/show/990.